In chemistry, a symbol is a code for a chemical element. [nb 1] Chemical symbols usually two letters long, but can be three depending on whether or not the element has a name yet, and are written with only the first letter capitalized. Chemical symbols often resemble classical Latin and Greek vocabulary. For some elements, this is because the material was known in ancient times, while for others, the name is a more recent invention. For example, "He" is the symbol for helium (New Latin name, not known in ancient Roman times), "Pb" for lead (plumbum in Latin), and "Hg" for mercury (hydrargyrum in Greek). Some symbols come from other sources, like "W" for tungsten (Wolfram in German, not known in Roman times). Chemical symbols may be modified by the use of prepended superscripts or subscripts to specify a particular isotope of an atom. Additionally, appended superscripts may be used to indicate the ionization or oxidation state of an element. They are widely used in chemistry and they have been officially chosen by the International Union of Pure and Applied Chemistry. There are also some historical symbols that are no longer officially used. The number of atoms of an element in a molecule or chemical compound is shown in the right subscript position (e.g., N2 or Fe2O3). Often omitted if the value is one. A radical is indicated by a dot on the right side (e.g., Cl• for a neutral chlorine atom). This is often omitted unless relevant to a certain context because it is already knowable from the charge and atomic number information values. ☾ Platinum Platinum 78 Alchemical symbol. ☉ Platinum Platinum 78 Alchemical symbol. 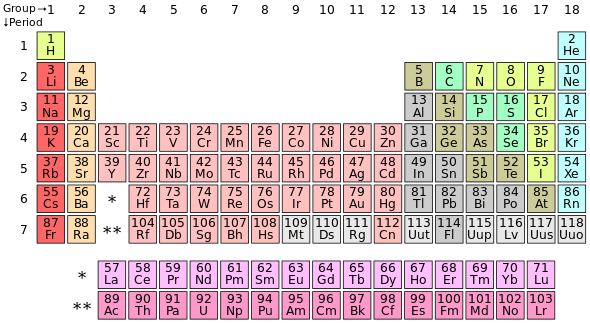 The following is a list of isotopes of elements given in the previous tables which have been designated unique symbols. By this it is meant that a comprehensive list of current systematic symbols (in the uAtom form) are not included in the list and can instead be found in the Isotope index chart. The symbols for the named isotopes of hydrogen, deuterium (D) and tritium (T) are still in use today. Heavy water and other deuterated solvents are commonly used in chemistry, and it is convenient to use a single character rather than a symbol with a subscript in these cases. The practice also continues with tritium compounds. When the name of the solvent is given, a lowercase d is sometimes used. For example, d6-benzene and C6D6 can be used instead of [2H6]C6H6. The symbols for isotopes of elements other than hydrogen are no longer in use within the scientific community. Many of these symbols were designated during the early years of radiochemistry, and several isotopes (namely those in the actinium decay family, the radium decay family, and the thorium decay family) bear placeholder names using the early naming system devised by Ernest Rutherford. ↑ This should not be confused with formula. When a number is present at the bottom right corner of the symbol of the element, only then is it said to be a formula, but if the number is not present, it is a symbol. 1 2 3 4 5 6 7 8 9 10 11 12 13 14 15 16 17 18 19 20 21 22 23 24 25 26 27 28 29 30 31 32 33 34 35 36 37 The element does not have any stable nuclides, and a value in brackets, e.g. , indicates the mass number of the longest-lived isotope of the element. However, three elements, thorium, protactinium, and uranium, have a characteristic terrestrial isotopic composition, and thus their atomic mass given. 1 2 3 4 5 6 7 8 9 10 11 12 13 14 15 16 17 18 19 20 21 22 23 24 25 26 27 28 29 30 31 32 33 34 35 36 37 38 39 The isotopic composition of this element varies in some geological specimens, and the variation may exceed the uncertainty stated in the table. 1 2 3 4 5 6 7 8 The isotopic composition of the element can vary in commercial materials, which can cause the atomic weight to deviate significantly from the given value. ↑ The atomic weight of commercial lithium can vary between 6.939 and 6.996. Analysis of the specific material is necessary to find a more accurate value. 1 2 3 4 5 6 7 8 9 10 11 12 13 14 15 16 17 18 19 20 21 22 23 24 25 26 27 28 29 30 31 32 33 34 35 36 37 38 39 40 41 42 43 44 45 46 47 48 49 50 51 52 53 Name changed due to a standardization of, modernization of, or update to older formerly-used symbol. 1 2 3 4 5 6 7 8 9 10 11 12 13 14 15 16 17 18 19 20 21 Name designated by discredited/disputed claimant. 1 2 3 4 5 6 7 8 9 10 11 12 13 14 15 16 17 18 Name proposed prior to discovery/creation of element or prior to official re-naming of a placeholder name. 1 2 3 4 5 6 7 8 9 10 11 12 13 14 15 16 17 18 19 20 21 22 23 Temporary placeholder name. 1 2 Holden, N. E. (12 March 2004). "History of the Origin of the Chemical Elements and Their Discoverers". National Nuclear Data Center. 1 2 3 4 5 6 7 8 9 10 11 12 13 14 15 16 17 18 19 20 21 22 23 24 25 26 27 28 29 Leal, João P. (2013). "The Forgotten Names of Chemical Elements". Foundations of Science. 19: 175–183. doi:10.1007/s10699-013-9326-y. 1 2 3 4 5 Fontani, Marco; Costa, Mariagrazia; Orna, Mary Virginia (2014). The Lost Elements: The Periodic Table's Shadow Side. Oxford University Press. ISBN 9780199383344. ↑ IUPAC. "Isotopically Modified Compounds". IUPAC. Retrieved 31 March 2015. ↑ Morgan, G.T., ed. (1905). "Annual Reports on the Progress of Chemistry for 1904". Journal of the Chemical Society. Gurney & Jackson. 1: 268. In view of the extraordinarily complex nature of the later changes occurring in Radium, Rutherford has proposed a new and convenient system of nomenclature. The first product of the change of the radium emanation is named radium A, the next radium B, and so on. ↑ Jurczyk, M; Rajewski, W; Majchrzycki, W; Wójcik, G (1999-08-30). "Mechanically alloyed MmNi5-type materials for metal hydride electrodes". Journal of Alloys and Compounds. 290 (1–2): 262–266. doi:10.1016/S0925-8388(99)00202-9.